Niche line Bond no. 9 will launch Soho, a new unisex fragrance. New York’s Soho has led multiple lives: colonial farmland … chic residential enclave … rowdy theatre and tavern terrain … the architecturally important light manufacturing zone known as the Cast Iron District … artists’ loft territory. And today? Today it’s morphed yet again— into luxury shopping turf, with every major designer ensconced in those characteristic, cavernous cast iron spaces. And by evening, still another transformation, into a quiet, stroll- able neighborhood. Yet no matter how it’s redefined itself, Soho has retained a durably distinct identity, separate even from the rest of hip-and-cool Downtown. Attracting locals and visitors alike, Soho has its own longlasting sillage, as we perfumers call it, blending high-end and edgy style. Soho centers on orange blossom. Additional notes include sweet orange, petitgrain, cassis, jasmine, orris, amber, musk, cedar and oakmoss. Bond no. 9 Soho will debut in September, in 50 ($260) or 100 ($335) ml Eau de Parfum. Ugh. I have lost enthusiasm for Bond so hard. 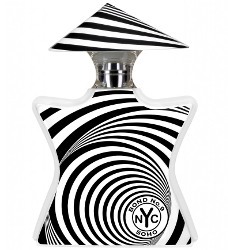 The bottle: looks like the motif Diptyque used for Eau de Sens. Last time I went to Saks, I heard a sales associate tell a customer that she wouldn’t make her a sample of Dubai Amber. Because Bond is an artisan brand and they don’t want anyone just wearing their fragrance or trying before buying. The price point is insane and they have far too many fragrances to keep track of, and most are not memorable, save for Fire Island and Chinatown. Lastly: every time I’ve shopped for Bond, the sales associates shill the products like they’re moving fruit at a bazaar. Unbelievably aggressive and I’m sure it’s because Bond demands impossible numbers. These fragrances and the way they are sold are so far from luxury it’s not even funny. I have too — and no argument with anything you said, plus, after awhile liked so little of their newer stuff that I stopped trying the new releases altogether. But I’m a huge fan of orange blossom and I love the bottle despite myself, so I will try it if I see it.